It is 8 pm on a Friday night and I am posting live from the reference desk at the same time as we have hugely successful (but oh so simple) program happening downstairs in our community room. 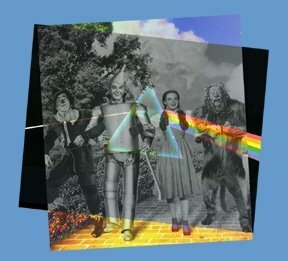 The room is packed to standing room only with around 150 people who are all watching and listening to a synchronized screening of the film The Wizard of Oz to the album Dark Side of the Moon by Pink Floyd. If you have never heard of doing this before, do a quick online search and you will find that there are quite a few web sites devoted to this topic — like The Dark Side of Oz and Dark Side of the Rainbow. One of my colleagues took over the desk for 10 minutes so I could go down and experience this for myself. I got to witness the tornado scene and the landing of the house in Oz… and it was awesome (especially with our state of the art surround system cranked to full-blast and the film projected on our giant screen). Quite frankly, we are a little shocked at how many people are here on a Friday night for this event. We expected maybe 40 or 50 to show up and instead we have a full-house with people of all ages from tweens to seniors. It just goes to show that you never know what will appeal to the community you serve. Kudos to Susan Conlon, our Teen Librarian, for this unique programming idea! I was also surprised by the size of the crowd and also the age range…from young kids to seniors and everything in between. We did this as a teen-only night program last winter and it was a hit, but a lot of adults approached me and said they would love to come to this if we did it again, so it was back by popular demand. Here’s a hint for the synch…the film’s running time is 119 minutes, and the album finishes at about the time Dorothy and the Scarecrow meet up with the Tin Man… it can play through a second time with lots of additional synch-ups, and the album concludes just about the time of the demise of the Wicked Witch… which is good time to bring up the sound on the film to finish up the last 10-15 minutes. From the Straight Dope article you cite, Blade Runner and Akira both match up with Pink Floyd’s Wish You Were Here. Can’t comment on how well, as I haven’t seen either synch-up. , he usually buy Archlord gold to start his game and most of the time he will win the archlord online Gold back and give me some cheap Archlord gold to play the game.